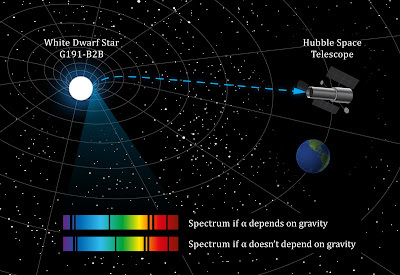 Scientists are using the Hubble Space Telescope and a White Dwarf Star (G191-B2B) to test if the Fine Structure Constant, or alpha (α) is not really constant. The Fine Structure Constant is defined as the charge of an electron squared over the product of Planck's constant multiplied by the speed of light. The resulting value is 1/137 or 7.2973525698(24)×10−3. This constant shows the probability of an electron absorbing a photon or simply the strength of the electromagnetic force exerted in an interaction. It relates to three important aspects of physics, electromagnetism, relativity, and quantum mechanics (through Planck's constant). The importance of the Fine Structure Constant (α) relates to the existence of life. If the value of α is not as it is, life or intelligent life as it is now, would not exist. A 4% change in the value of α would mean that stellar fusion would not create carbon, making carbon based life impossible. If α were > 0.1, stellar fusion would be impossible and no place in the universe would be warm enough for life as we know it. Using a white dwarf star with a gravity 30,000 times more than the Earth, scientists are measuring the strength of the electromagnetic force with the help of the Hubble Space Telescope. They will compare that value to that measured on Earth to determine if the Fine Structure Constant is really not constant and that it varies across the Universe. "Then we should be able to measure any change in alpha down to one part per million. That would help determine whether alpha is a true constant of Nature, or not."